I move house tomorrow, for the second time in six months. Our last experience was hectic and disorganised and taught us valuable lessons, so I thought I would share with you my top tips for how to move house without getting stressed. 1. De-clutter. We lived in our previous house for four years and during that time we had amassed an enormous amount of stuff that we simply didn’t need. Consequently, when we came to move we were disheartened by the seemingly never-ending amount of rubbish and extra boxes. This time, however, we downsized and were ruthless with our possessions. If I hadn’t watched a film, read a book, played a CD or worn an item of clothing in the last year it was put in a bag and taken to a charity shop. I shredded paperwork that had been filed away for YEARS (I found bills from 2005). As a result we have packed about ten fewer boxes this time around. 2. Approach the packing on a ‘bit by bit’ mentality. If you only have a few weeks to move, as we did, work on a room at a time and get into a routine. Avoid letting it take over your life – an hour of motivated and quick packing each evening and three hours of packing on a Saturday and Sunday morning will still allow you to enjoy the rest of the day. If you have older children, get them involved. 3. Pack your items according to room and label your boxes clearly. 4. Put several changes of clothes, underwear, towels and toiletries in a travel bag, as you would when going on holiday, and keep these with you. This means that you will be able to have a shower the day after the move without scrabbling around in the dark and having to wash your hair with shower gel, as I had to after the last move. 5. Be pro-active. Order a removal firm as early as possible. Inform the companies that supply your utilities of your impending move – some of these can set up a changeover in advance, saving you time when you arrive in your new property. 6. Take up any offers of help. I’m lucky to have really supportive friends, and when one offered to help with the move tomorrow I gladly accepted. The extra pair of hands will make the process much quicker. 7. Keep valuables and important paperwork with you – passport, jewellery, money – things that are important should be placed in a rucksack and carried on your person. 8. Try to finish everything a few days before to allow yourself to have a mental and physical break before the move. Reward yourself after the job is done – The Bloke and I will be eating a take-away pizza and watching a film tonight to relax, and then we will go to bed early to make sure that we are as rested as possible for tomorrow. 9. Before the move, attempt to organise the furniture that you want put into each room. 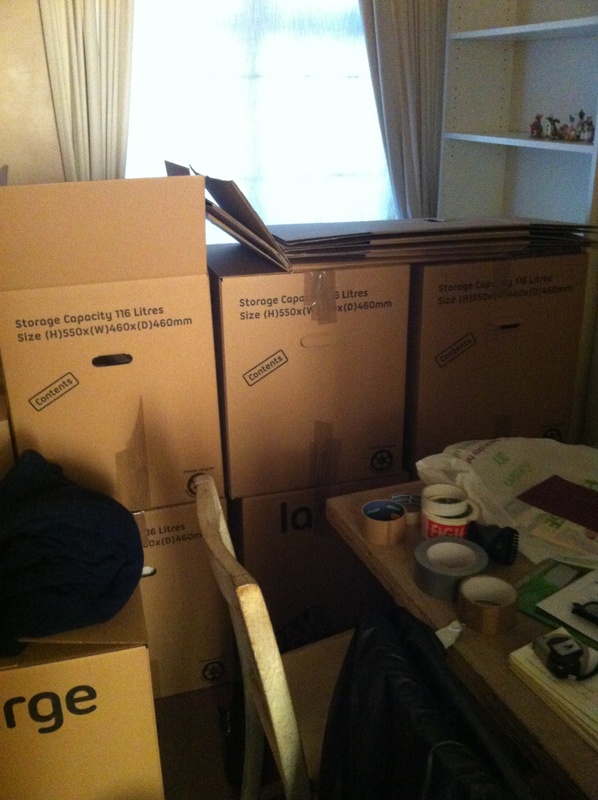 Our removal firm is amazing and willing to put boxes in specific rooms. If you are doing the move yourself, take that little bit of time to do this – it may take a little more time at first, but will save you hours in the long run. 10. Moving house is always going to be a busy process. Don’t take your frustrations out on those around you. Smile. Use manners. Keep refreshments out and available – cups of tea and snacks will help to keep everyone’s energy up. Happy removal people and or happy friends = more enjoyable move. What about you guys? Any packing and organisation tips when moving house? Good luck, and don’t forget the bloke, or the cat. A very good list. I hope to only move one more time in my life. Another item on the list might be “Expect something to go wrong.” You may not know what it is yet, but there’s some detail overlooked or something unexpected waiting. Just know that not everything will go perfectly or smoothly but if you’ve covered all the major things you can handle whatever else might come up. Unfortunately, I have moved so many times I’ve got this Dow to a science. Here’s to being settled for a while. Thanks for the like, liked back ;). My girlfriend and I have been looking for a place to share the rent, so your tips are very helpful. I think I may start on some of the decluttering today. Best wishes Suzie! The universe is just making sure you and the bloke get into position before good fortune rains down on you. I hope it’s a torrential downpour. You’re due. If you’re moving on St. Paddy’s Day, you’ll have all the luck you need! 🙂 Good luck with the move! Good Luck Suzie! I totally feel for you, I’ve moved soooo many times that I am unable to be a pack rat, hahaha. I hear my hubby talk about moving when he retires and I just look at him and pray that he changes his mind. I love it here…..the yard is big for the furkids to play and I think Sami our cat would have a fit if she couldn’t roam the woods! Some great tips! Have to agree with Fearless Leader on the alcohol thing though! Lay in tons of catnip for the felines – gets them acclimated REAL fast! Suzie, what great advice – thanks for sharing from your unfair experience. Might I add a few other things to do when moving? Invest in a pack of wide nib, black permanent markers for marking boxes. This isn’t the time to run out of ink. Ask your “old” landlord to come to the original residence just before you walk out the door so you can show her that the place has been left in good condition. Take photos of your newly empty old residence just before you lock the door one last time. Know where to leave the keys. Be certain you have all your essential medication for at least one week in that overnight bag as well as the phone numbers for refilling your prescriptions. Include eye glasses and contacts. Add a first aid kit, toilet paper and tissues box to that overnight bag. And work gloves. Make sure you have the keys to your new residence. Know how to locate your new landlord on the day you are moving in. It’s not the same as having a contact number for everyday use; they need to know you are moving in and might need to get hold of them immediately. Get the keys. Know where the emergency services and phone numbers for your new neighborhood are located: police, fire department, hospital and clinics. Inform your bank and credit card companies of your move so they are aware of bills showing up in strange locations. Know the new utility services phone numbers and locations. Know when they expect bills to be paid and when you can expect to be charged, if you’ve set up auto payments. Know where the grocery, gas station, pharmacy, post office, and nearest branch of your bank are located. Know where you are allowed to park, even if you have a garage, and the easiest way to get to the nearest gas station, and the highway, freeway, and public transportation access. Know if there are days you aren’t allowed to park on the streets. Back up your computer to a safe off-site location before you turn it off to move it. Even though you probably do this on a regular basis, remember that moving isn’t regular, and it’s easy to forget the regular stuff. If you have kids: get them enrolled in their new schools and daycare as soon as possible, hopefully before you move. If you have young children, arrange day care for moving day. I would even sacrifice the work of a close friend to take care of the kids instead of helping with the move, because knowing your kids are safe and well cared for will help your state of mind as you move. Grandparents are wonderful for this. Put pet items, especially their meds, food and bowls, etc., into a marked box so you can get them ASAP. Kennel the pets on moving day. Expensive, but much safer. Pack a cleaning box, one with essential items to keep your new place clean as you go. Hopefully you are moving into a freshly cleaned place, but you will make messes as you work, so this is necessary. Make sure you include cloths and paper towels as well as the products. Mark your boxes as you pack: Essential; Soon; Later. You’ll know what they mean once you start unpacking. Mark on the boxes the rooms they are meant to go in; abbreviate of course: Bedroom; Kitchen; Bathroom. Try to keep one section of your new residence empty of boxes so you have room to work and move things around. Set up at least a card table as soon as possible, with a few chairs, so you can sit for a meal. Get as much laundry done in advance, and know where the pillows, clean sheets, blankets, and towels are for your first night and day. Cash (at least a bit in small bills) and credit cards. If you have kids: health documents and school records for them. Insurance documents; make certain to include health, car, residence rental, and any other residence insurance forms you have. Any tax papers due to be paid in the next 2 weeks, and any other bills that must be paid in the next 2 weeks. If possible, pay everything in advance. Current bank statements and checkbooks, and whatever bank and investment papers you don’t have on your computer. You should also know and be known by at least 2 important people at the bank where you regularly do business so you can be identified by sight. Legal documents, should you have them, such as wills and trusts. You should have originals and/or copies of these with your attorney and/or in your safety deposit box as well. Investment statements, including copies of addresses and representative’s contact phone numbers. Hard copies of really important addresses and identification, just in case you can’t get the computer on quickly. Your new rental agreement and your old rental agreement. Irreplaceable and/or heirloom jewelry, coins, photographs, documents, etc. New phone batteries and charger. Flashlights and batteries, because you might need them. Most of us now have many/most/all of this information on our computers, but remember that the computer might not get hooked up immediately when you move. Have hard copies of anything important. Keep as many of these items, along with those that Suzie already listed, in one location in your new residence once moved. Should you ever need to evacuate or leave residence in a very short time for any reason, you will be able to quickly gather your most important items to take with you. And one small thing to pack for the very first night: a flameless candle, so when you have that pizza, you can also have a bit of something lovely on that first chaotic, exhausted evening in your new home. Then, unpack slowly and in organized fashion. This is where Essential, Soon, Later come in. Take photos as you go. Write a thank you note or email to the friends who helped on moving day and invite them over next month for homemade soup or take out Chinese. Get to know the new neighbors and the neighborhood. Find the parks, libraries, shops, restaurants, walking paths, galleries, public pools, sports fields, museums. Enjoy your new place. Suzie, the best to you and The Bloke in your new home. I can’t wait to read about your adventures. Too much stuff. Anything that you have not used within a year should be gone. Have you ever seen George Carlin talk about Stuff? Sounds like great advice! I’ve never moved, but I’ll have to keep this in mind whenever I do. Good luck to you! This is a fantastic list. I hate moving but know I will have to at some point. I regularly declutter. I use one further principle…would I want to pay someone to move it for me? Hope today is going as well as planned! Thank goodness for Throwback Thursday! We’re moving in two weeks!! Eep!! When I moved to Birmingham 16 years ago my possessions could fit in the back of a car. It’s amazing how much I’ve amassed, even with doing huge clear outs every so often! I haven’t moved in over 30 years! Every once in a while I cringe at the thought of having to pack up decades of stuff. So I have decided to stay in this house until I die and leave it to my kids to pack it all up! Hahahaha! That’s one way of thinking about it – I like your style! So many great tips! Need to book mark this for a few weeks time when hopefully we get to move into our first house!